Sophie Nélisse wears black high top Converse “Chuck Taylor” All Stars in the film. Brash young Gilly Hopkins is out to beat the foster system. 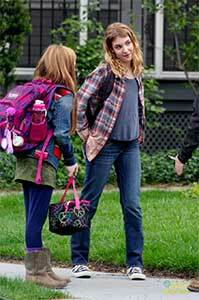 Galadriel Hopkins (Sophie Nélisse), is 12 years old, with unkempt hair and a tomboy appearance. She doesn’t like her given name, (after Galadriel in The Lord of the Rings), and prefers to be called “Gilly”. Put up for adoption by her birth mother, Gilly has spent most of her life in the foster care system. Bright and creative, Gilly has become bitter and angry about her situation, and very independent, rejecting the advances of anyone who wishes to reach out to her. Seen by most people as unmanageable due to her unfriendly demeanor, Gilly has already been moved around to several different foster parents in her young life. As the film opens, Gilley is being dropped off by Mr. Ellis (Billy Magnussen) from the foster care system at the house of Maime Trotter (Kathy Bates), and told that she needs to make this placement work. Mrs. Trotter tries to be kind and welcoming to the somewhat jaded Gilly, who finds this attitude to be smothering. But Mrs. Trotter has her rules and ways of doing things, and for Gilly, Maime’s warm-hearted and non-judgemental acceptance of her is at least intriguing. The Trotter household also includes William Ernest (Zachary Hernandez), an autistic seven-year-old boy who she literally terrifies at first, and Mr. Randolf (Billy Cobb), her blind next door neighbor, who comes over for dinner every evening. Mr. Randlolf has a great interest in English literature but can no longer read from his beloved collection of books. He asks Gilly to read to him from one of his many poetry books after the meal. Gilly is surprised by this but soon takes advantage of him by stealing money she finds stashed away in Randolf's library. Gilly is overwhelmed by the endless loving care she receives from Maime despite her behavior. Things are pretty much the same at Gilly’s new school. She is mean and aloof to the other kids, including Agnes (Clare Foley), another new girl at the school who tries to make friends with her, and Rajeem (Sammy Pignalosa), a classmate who was asked to help tutor Gilly to get her up to speed in her math class. She does do a nice thing for W.E. — although she warns him that this is one-time only — when she takes on three older boys who are bullying him and taking his lunch away. But this is also to assert to her peers that she is not someone to be messed around with. A typical early scene shows her deliberately creating an incident on the playground by taking a basketball that rolls her way, then running away with it rather than returning it, which leads to a fight and eventually puts her on the hot seat in the principal’s office. Gilly is fully capable of being a top student, but instead decides to take on her African-American math teacher Miss Harris (Octavia Spencer), by sending her a racist message. She is doing these things because she wants to be kicked out of school. But Miss Harris is more than up to the situation, and in a one-on-one meeting puts Gilly in her place and tells her that her ploy won’t work. This whole scenario doesn’t ring true, because Miss Harris is a good teacher, and Gilly is not very good at being a pretend racist. If the point of the film is to show that Gilly is misunderstood, it totally backfires as a plot device and scene in the film. Gilly sitting on the front porch with Mr. Randolph. Eventually we learn what the purpose is behind Gilly’s insufferable behavior towards others: she wants to be reunited with her birth mother, whose life she imagines as spectacularly glamorous. With the money she stole from Mr. Randolph she tries to run away but is caught at the bus station and returned to Mrs. Trotter. The final key in her plan comes when she writes a letter to her mother describing how horrible her life is and how she is desperate to see her again. But the address her letter is sent to is actually that of her grandmother Nonnie (Glenn Close), who didn’t even know that Gilly existed. Nonnie takes what Gilly says seriously, and contacts family services to take custody of Gilly. However, the wheels of beauracracy move slowly, and by the time Nonnie arrives at the Trotter home to check on Gilly, Gilly realizes that she actually likes the family dynamic at the Trotter house and doesn’t want to leave. She has learned to care for W.E., helping him with crafts, reading, and a few lessons in self-defense, so he can deal directly with school bullies. By offering Gilly access to his home library, Mr. Randolph shares with her the beauty and importance of poetry. Finally, Gilly begins to comprehend that Trotter is a real mother, not an imaginary one like her birth mother who she discovers is not the glamorous person she thought and has no intention of raising her. But the law says otherwise, and Gilly’s whole plan to leave has backfired on her by actually working and giving Nonnie custody of her. Now the coming of age factor kicks in, as Gilly begins to understand what is really important in life and how her personal choices and behavior matter. Agnus helps Gilly get to the bus station. The Great Gilly Hopkins is based on the book of the same name by Katherine Paterson. In her work, she is not afraid to take on serious topics like child abandonment, the impact of the foster system on a kid, and how someone like Gilly can become hardened in her behavior and attitude in a very negative way. As the film opens, and you experience this behavior as a viewer, you want to see Gilly kicked back out on the street or at least brought to task for her rude and mean behavior. This realism in the story line is part of the reason that the film works. Sophie Nélisse is well cast as Gilly and has the stage presence to make you like her even when behaving at her worst. The fine supporting cast of Kathy Bates, Glenn Close, Octavia Spencer, Zachary Hernandez, and Billy Cobb is well directed by Stephen Herek. This is a good family film, especially for kids who are in that middle age, with lots of topics for discussion generated by the story line. Their normal daily experiences make it easy for them to relate to The Great Gilly Hopkins and learn a few good life lessons from it. Gilly meets Miss Harris and her new classmates. Gilly is distraught when she realizes that she will have to leave Maime's care. Sophie Nélisse in her role of Gilly Hopkins, wears black high top chucks throughout the film. These are the perfect sneakers for the brash twelve-year-old with attitude. The camera work is chucks friendly in this film, with many fully framed shots of Gilly. On of the best close up shots is when she realizes that her plot to get away has succeeded too well, and now she will have to move away to her grandmother’s house. There is another good sequence near the start of the film, when Gilly steals the basketball a number of kids are playing with on the school playground, and tries to run away with it. Gilly goes to grab the basketball when it rolls over to her. The Great Gilly Hopkins. (2015) Sophie Nélisse, Kathy Bates, Glenn Close, Octavia Spencer, Zachary Hernandez, Billy Magnussen, Clare Foley, Bill Cobb. Directed by Stephen Herek. Categories: Coming of Age, Drama, Family.